So sorry for the falling off the edge of the earth. I had some major computer issues. Actually my computer decided it had had enough of my shenanigans, my predilection for picking up viruses and my foul language so it sent me a few nasty messages then went dark for good. So now I have shiny new computer. Its very pretty and extremely cooperative. So far. My bank account is still sobbing however. As far my knitting goes, well, apparently there is a lesson that even after all these years I just refuse to learn. And that is...DO NOT KNIT WHEN EXHAUSTED, LAURA! I had a lovely pair of toe up socks on my magic loop. I managed to get as far as turning the heel and it all went to hell. And every time I went backward to fix my mistakes the whole situation just got worse and worse. I was just too tired and watching "Attack the Block" (which was quite good by the way, once you figure out the accents) was too much of a distraction. Stooopid idgit. I SO know better. Anyway the whole mess got frogged. In anticipation of including a few photos now that I'm back to blogging I tried to take a picture or two of my recent fingerless gloves - knit with Imagination sock yarn from Knit Picks that I'm crushing on right now. So pretty. Dug out the camera, took a few pics (fighting Cali off who was taking an intense interest in the process), took the little card out of the camera (because Max still has the usb proprietary cord arghhhh)...finally found the port on my new computer which was set in the least obvious place...of course... and realized that I still need to download Picasa. I give up. I tried. Let us get to the magazine in a moment because that is all kinds of awesome and worth waiting for. 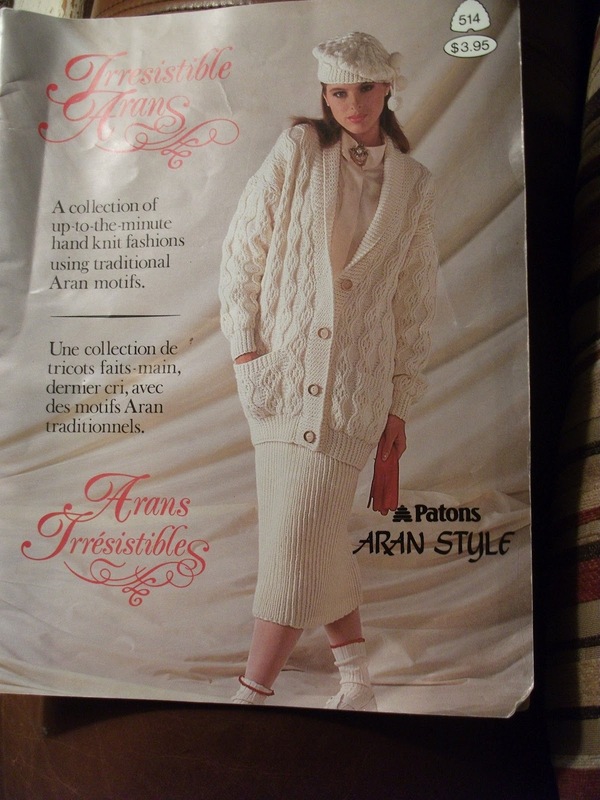 The yarn is Eaton's brand "Fisherman's Knit Aran", 70% acrylic and 30% wool. Interestingly, there is a little logo on the band. It's very official looking isn't it, with that little microscope. 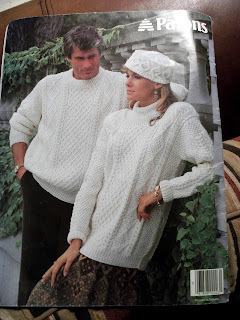 I'm not certain what there is about this yarn that requires microscopic investigation or a research bureau to control the information, but then the 80's were a different time. 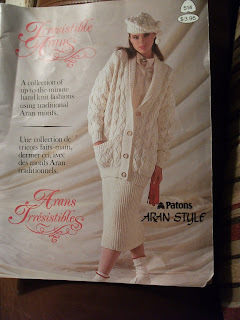 The magazine was tucked in with the yarn and is Paton's "Irresistible Arans" circa 1986. Irresistible may have been a reach. As they say, everything comes around again, so perhaps the beret with the with the four inches of ribbing and dangling poms is back in style, however I am fairly certain that the 'socks with shoes with skirt' combination never made its way back into our fashion consciousness. Do you remember shoulder pads? I myself had a collection back in the day and swore wearing them made my hips and waist look tinier. In retrospect they simply made me look like a linebacker. Look at the size of those things. And one more blast from the past...big hair, Dallas style. t I find it interesting that the patterns may have changed over the years but the yarn hasn't. This yarn has apparently sat hidden away for over 20 years. That is older than any of the stash I have. 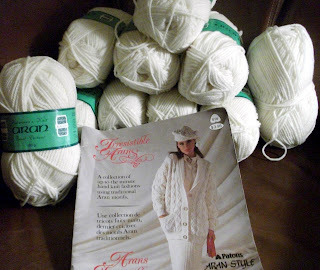 And it is in great shape, waiting to be knit. And the fact remains that I scored 10 skeins of yarn, for free. And while my dislike of acrylic has been duly noted a mutitude of times on this blog I cannot deny the practicality of an acrylic/wool blend. I think a sweater is now in the queue, but I think I will pass on the shoulder pads. 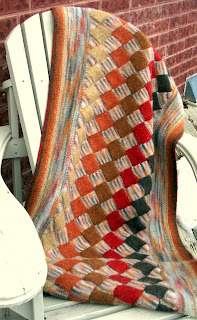 The entrelac blanket is done, finally, and I love it. Super warm, thick and cozy. The colours turned out fine, though I don't think I will ever be a fan of variegated yarns. But a gift of Berroco Raku is always welcome and appreciated and I think I did the gift justice. I knitted the center entrelac panel then picked up all the edge stitches ( and there were hundreds and hundreds) on two 60" circs. And around and around I went, taking care to increase at every corner, until I had only enough yarn left to bind off. After it was all said and done I felt that it had a too much drape, probably due to its size. So, to tighten it up, I felted it. I have a front loading washer so that was out. I had read about dryer felting though it doesn't appear that it is very common. But what a revelation it was. Easy peasy. I soaked the blanket in the sink in very hot water for about 20 minutes, lightly rung it out and threw it in the dryer on its regular heated cycle for about twenty minutes. What I think is so brilliant about this is that dries as it felts so I didn't have a sopping wet blanket to block. It was certainly damp and it took a couple days to dry completely but still much better than felting it in the washer. I love working with wool. I have to say I would not have been as thrilled with the blanket had I not been able to felt it. It was an eleventh hour decision due to some uneven stitches and unsightly corner increases. As well, I seriously dislike obviously visible wrong sides. And the wrong side of entrelac is not pretty. The felting totally took care of thoses issues and gave it, dare I say, a professional finish. The wrong side has ridges around the entrelac blocks but they now look purposeful. I didn't felt it entirely. There is still some stitch definition left. I thought I would stop while I was ahead, but perhaps the day will come when it needs a bit of a cleaning and I will give it another go-around in the dryer. I throw it over my legs every night as I knit. It's thick and soft and I believe I will still be enjoying it when I'm eighty. And how many things can you say that about. I was at the gym yesterday. This particular gym specializes in classes; core, kick, step, spin etc. And I rotate between them all and I am, with the exclusion of my recent sick days, quite consistent in attending. One of the teachers approached me and asked if I would have any interest in teaching classes myself. Now this I might have expected 10 years and forty pounds ago, but to be asked now - well, that is interesting. If I were to pursue this I would need a plan. A serious diet and fitness shape-up plan. There are definite inticements here. And there are many things to consider. A) I would have a built-in part-time job; instructors are in high demand in my rural area; b) being a teacher/instructor is tailor made for my personality; c) it would go a long way in reigning in my weight and smoking struggles; d) it would be fun, I love the whole gym and fitness thing and always have. I'm not certain if this is a road I will choose to travel but regardless, it reinforces my belief that you never know what is around the corner. Worrying is, by and large, wasted time. And that while life can be hard we can, perhaps, find balance in the opportunities and surprises that come our way. I love surprises and this was a big one. Today, I am heartened. And in a very random aside, this is my new wallpaper that I downloaded last night. I think it is very beautiful and it makes me happy every time I start up my computer. It comes as no surprise to me that I am sick again, this time with a monstrous cold. I rarely get sick. I expect this is due to a combination of good genes (hearty Dutch and English stock), almost daily Greens+ and fervent handwashing. But when my immunity gets felled I tend to get one illness on top of another, making up for lost time I imagine. All my body wanted yesterday was sleep. And I left work early to accomodate it. Sleep in my bed, sleep on my couch. I was exhausted, blearly eyed and suffering from the usual sneezing and sniffling depicted so well on all those cold medicine commercials that play non-stop this time of year. Anyway, Max was to come home from university last evening and asked to be picked up from the train station, about 40 minutes drive from home. At 7ish. But maybe 6:30ish, he wasn't sure. Because he is a) male and b) a teenager he had lost his phone and couldn't contact me on the road and I suspect wasn't organized enough to catch the appropriate train and connecting bus to get him there on time. Long story short - I sat in cold car (alternating running the car for warmth and then not to conserve gas), in a dark, empty parking lot for 2 1/2 hours waiting for him. He was only saved from being torn asunder by me because hours of building anger and illness had totally burnt me out by the time he finally arrived. When I awoke this morning after the lousy sort of sleep one has when one is sick I see the camera I had appropriated from Ben and have been using for this blog sitting on the table apparently to be taken on Max's travels to meet up with friends this weekend. I'm not thrilled to be losing the camera all weekend but I can live with that. What frustrates me is that when I went to grab the cable to download the pictures I have sitting on it, a cable I am careful to always leave in the same place so it is always on hand, I couldn't find it. Of course. God only knows what he has done with it. c) something else I cannot recall but that I am sure was inspired and riveting. I am making the infamous Cabbage Soup this morning in an attempt to kick start better eating habits and to detox my way out of this cold. I was going to take pictures. I guess its back to my old camera. I had better be able to find the cable or blood will be shed. I have been giving some thought to places I would like to see and things I would like to do, not so much "before I die" but more "if I ever have the opportunity". My life of single motherhood has been rife with responsibility and time and money have been in short supply. I have developed an armour of pragmatism and lack of sentimentality to cope with those responsibilities. This is not a new story, I have met many single moms who cannot afford, either financially or emotionally, to acknowledge their own hopes and wishes. Perhaps this coming to terms with our individual realities is simply part of growing older or a result of the harsh realities of life, nevertheless, it is still sad. 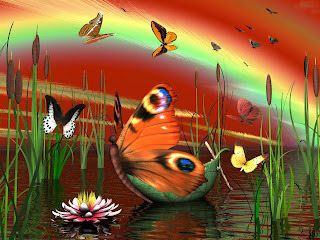 Over the years I have simply shut down the part of me that longs to see beautiful things and explore fabulous places. My brother and my parents have all travelled extensively and there is a particular pain in being left behind, to hear them tell their stories and to covet those experiences. I am neither proud of, nor comfortable with, my self-pity, but there it is nonetheless. So I have decided to open a little window into my own personal longings to see what may still linger there. First up: the Victoria and Albert Museum. I actually went to this museum many years ago, though my memories are sparse. The V&A is a museum of art and design located in London, England. It is massive and world-renowned and exactly suits my taste in museums - focusing on textiles and history, decor and design. Can you imagine standing here, surrounded by all this jewellry? Wonderful. Would you like to go on a little adventure and see something really interesting? You are looking for this. Go here. 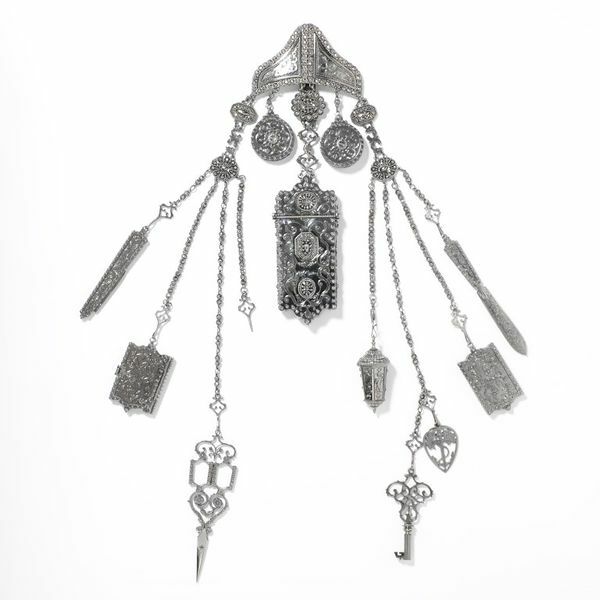 Wait for it... wait for it... there it is at the top, its called a chatelaine. Now, click on the image. And again. And again. See? Isn't that amazing? I love that. This is hand done and simply gorgeous. Creepy AND wonderful. 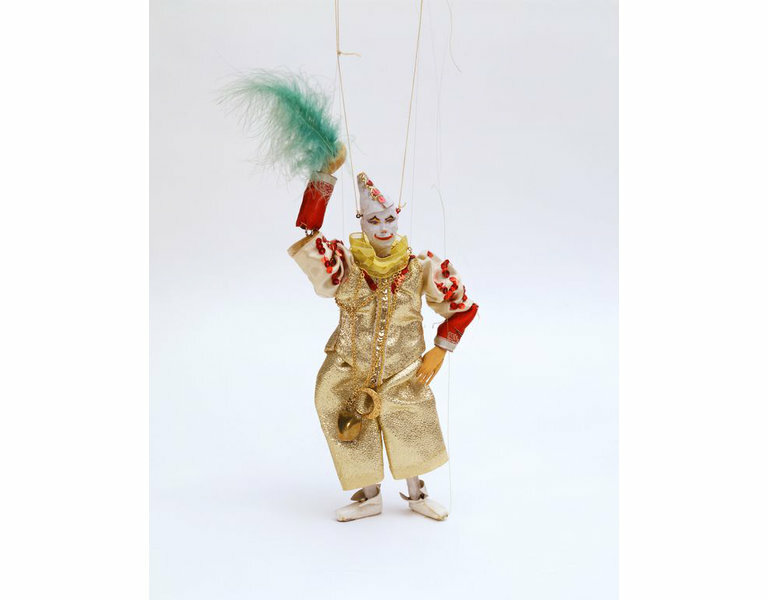 Ever since seeing The Sound of Music as a child I have had a thing for puppets and marionettes. I could look at excellent photography for days. 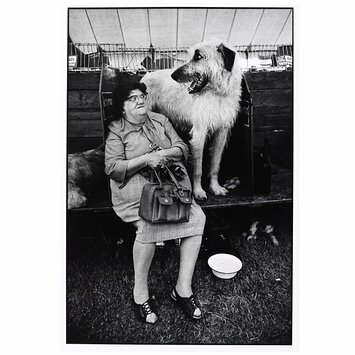 The most riveting photos to me are the ones that shout a story. I love this one. It made me laugh out loud. This is the V&A Cafe. I very much want to sit there and have a cup of tea and a piece of cake. This could go on and on. The link is here should you be interested.